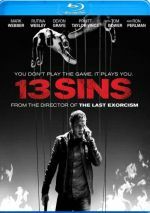 A thriller that looks at how far people will go for money, 13 Sins introduces us to an earnest New Orleans insurance salesman named Elliot Brindle (Mark Webber). Buried in financial debt, he plans to marry pregnant fiancée Shelby (Rutina Wesley) but feels worried about this given his money issues. Those problems intensify when he loses his job. This leaves him more desperate for cash than ever, so he feels excited when he gets a chance to play a “hidden camera” game show that will reward him with a sizable monetary reward if he wins. What does Elliot need to do? He must complete 13 tasks of varying intensity. These start small, as the first requires Elliot to swat a fly – and then for the second, he must eat the dead insect. If Elliot backs out before he finishes all 13, he loses everything he “earned”, so we follow him as he finds himself stuck in increasingly dire circumstances. Just last year I watched a horror flick called Would You Rather. It boasted a similar theme, as it involved participants who had to undergo outrageous challenges to win money. I liked Rather and with a similarly intriguing premise, I hoped Sins would work well, too. Happily, it does – for a while, at least. Of course, it stretches credulity much of the time. For one, we have to accept that ala The Game, there’s some private group with virtually all-powerful means, and we have to swallow that Elliot believes this, too. Sure, we see that they deposit some money in his bank account, but I still think he accepts his contact’s claims a little too easily. After a fairly small amount of money comes to him, he goes to the races without any evidence the parties involved can and will come through with the millions they promise. 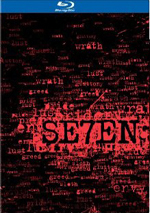 If we buy into these concepts, Sins delivers a tense and entertaining proposition through its first two acts. Webber does well in the lead, as he depicts Elliot’s meekness and slow growth nicely, and the escalating nature of the challenges offers dark fun. We know things will get uglier and uglier, but it becomes perversely involving to see the tasks as well as Elliot’s reactions. It can be tough to conclude a tale like this in a positive manner, however, and that’s where Sins hits a wall. I don’t want to offer spoilers, but I think the film’s conclusion fails to work on many levels. Granted, I find it hard to come up with a fully satisfying manner in which this tale can conclude, but I think the finish doesn’t quite work. Also on the negative side, Devin Graye’s performance as Elliot’s mentally disabled brother Michael doesn’t work at all. Essentially it feels like Graye watched Rain Man five times and based his acting on that. Graye delivers a fake, embarrassing turn. That’s only a small blotch on the movie, though. Director Daniel Stamm paces the film fairly well, and he balances tone in a positive manner, too. Sins occasionally goes for a comedic feel, but it does so in a dark way, and Stamm maintains tension the whole way. Heck, even though I think the third act flounders somewhat, it keeps the anxiety in play, as Stamm sets the table in an effective manner. No one will mistake 13 Sins for a classic thriller/horror effort, but it still delivers a pretty compelling piece. Despite the occasional missteps, the movie offers a dark, involving film much of the time. 13 Sins appears in an aspect ratio of approximately 2.40:1 on this Blu-ray Disc. Though not an eye-popping presentation, the transfer served the material well. In terms of colors, Sins went with subdued tones, as the movie tended toward an amber feel; some blues cropped up as well. The hues never stood out as memorable, but they weren’t supposed to be impressive, so they were fine for this story’s stripped palette. Blacks were pretty deep, and shadows were well-depicted. The image offered a solid “B+” presentation. With that we go to the set’s extras and find an audio commentary with co-writer/director Daniel Stamm and actors Mark Webber, Ron Perlman and Devon Graye. All four sit together for a running, screen-specific look at story/character areas, cast and performances, various effects, sets and locations, music, and some other domains. Despite the inevitable happy talk, the commentary digs into the subject matter well. In particular, Stamm offers good insights about the film and various choices. We get a good level of introspection in this mostly effective track. In The Making of 13 Sins, we find an eight-minute, 38-second piece with Stamm, Perlman, Webber, Graye, producer Brian Kavanaugh-Jones, stunt coordinator Stanton Barrett, production designer Jim Gelarden, and actors Pruitt Taylor Vince, Tom Bower and Rutina Wesley. The show covers story/character/script areas, cast and performances, Stamm’s work on the set, locations and production design, and reactions to the film. We get a few decent comments but not much insight from this short promotional piece. Anatomy of a Meltdown goes for two minutes, 42 seconds and features an intro from Stamm. He lets us know how stressful the filmmaking process can be and then shows us co-writer David Birke’s unhappy reaction to the notion that one scene will be cut. Calling this a “meltdown” seems strong, as Birke doesn’t freak out, but it’s still interesting and unusual to view something of this sort. Most Blu-ray extras try to convince us everyone was a happy, happy team 100 percent of the time, so I like the inclusion of this short clip. The set also includes a Deleted Sequence (5:50) and an Alternate Ending (2:01). The “Deleted Sequence” shows another challenge, while the “Ending” offers a dark twist on the movie’s conclusion. I like the “Deleted Sequence” a lot, and the “Ending” seems fairly interesting as well. The disc opens with ads for Blue Ruin and Dark Skies. No trailer for Sins shows up here. Though not a wholly satisfying thriller, 13 Sins does a fair amount right. It may peter out as it goes, but it still brings us a reasonably tight, tense experience. The Blu-ray offers positive picture and audio along with some interesting bonus materials. The movie has some flaws but it’s usually pretty good.